The federal government serves as one of the largest funders of research and development at American academic institutions, contributing more than $28.4 billion to 1,316 academic institutions for science and engineering activities annually. Rather than providing an exhaustive list of all academic research and development activities taking place in every state, the list below highlights one institution from each to demonstrate the vast amount of R&D being done by massive public institutions and small private schools alike. All told, some 37 public and 14 private universities and colleges made the list. After reviewing these schools, keep reading to learn more about the various federal agencies and departments that provide funding each year. Recent innovations include advancements in the areas of biomedicine, oncology and bio-safety. Some of the areas the school is working to innovate include climate change, volcanological research and high-latitude biological systems. Research initiatives unique to Alaska include work studying reindeer, the health of native Alaskans and arctic biology. The school is also ranked first in observational, theoretical and space astronomy programs, which helps explain why NASA awards Arizona more research grants for space travel than any other school; NASA missions to Mars are powered, in part, by equipment from the U of A. Clinical researchers at the school performed the first outpatient bone marrow transplant in America and the first gene therapy for multiple myeloma. Areas of innovation include developing techniques of recombinant DNA, prenatal tests for sickle cell anemia, synthesizing human growth hormones and contributing to the creation of the hepatitis B vaccine. Highlights of Denver's recent research initiatives include work on skin diseases and the general health of lab mice, concussions and end-of-life care. Yale's total research expenditures for the 2014 fiscal year amounted to $548.4 million. Of the over 850 faculty members dedicated to research, 625 work in Yale Medicine and 172 work in Yale's Arts & Sciences school. As one of the top 100 institutions for federal R&D obligations, the University of Delaware received $69.54 million in the 2013 fiscal year. These funds are used in a variety of different research initiatives, ranging from genotyping and histotechnology to computational biology and gene editing. The Carnegie Classification gave the school a ranking of very high research activity. Other highlights include the school's engineering research, which accounts for over 40% of all research expenditures, and the school’s solar energy research institute, the oldest in the world. Areas with the largest research funding include engineering, applied science, medicine, health sciences, public health, engineering, and the arts and sciences. The school's recent opening of a brand new Science and Engineering Hall, equipped with a rooftop greenhouse, perfectly captures GWU's commitment to the forefront of research-driven academics. Some of the most recognizable inventions and innovations coming out of UF include Gatorade, Trusopt (a treatment for glaucoma) and the Sentricon Termite Elimination System. The school is especially focused on supporting startup ventures, with both VentureLab and the Advanced Technology Development Center on hand to support initiatives. Georgia Tech has partnerships with renowned universities and private businesses, including Emory University, the University of Cincinnati, the University of Panama, the NIH and the Cystic Fibrosis Foundation. Three of the school’s leading researchers in geophysics and planetology are currently preparing for a mission to the moon in 2020. Among other notable innovations, the school has the distinction of cloning the first equine animal, a mule, in partnership with Utah State University. A leading researcher at the school is credited with creating pregabalin, a synthesized organic molecule that ultimately became Lyrica. Recent research breakthroughs in engineering, one of Purdue's most prominent areas, include work on beams for bridges in Indiana, improved concrete (also for bridges) and development of better steamrollers and road paint trucks. The institution prides itself on incorporating undergraduates in research initiatives, with 1,280 seniors from the class of 2014 participating in research projects outside normal coursework. This public research institutions ranks in the top 12% of all American institutions, landing 74th out of 643. In the 2013 fiscal year, the school received federal R&D funds in excess of $174 million. These funds are used for work conducted in areas like biodiversity and policy research. One of the most unique avenues of research is conducted at the Center for Remote Sensing of Ice Sheets, which is actively working to understand how changes in the sea level affects the mass balance of ice sheets in Antarctica and Greenland. Clinical trials currently being conducted at Kentucky encompass a vast array of interests, including obesity, cancer, sleep disorders and drug addiction. The Baton Rouge campus of LSU received $94.6 million from federal departments and agencies for R&D in 2013, up from $92.6 million in the previous fiscal year. Compared to the statewide allocations for the same year, the institution received 34% of the overall budget. The school currently funds more than 1,000 research projects, in topics ranging from materials science and high-performance computing to communication and individual behavior. Recent research highlights include working with wetland areas in the wake of Hurricane Katrina. Unique research coming out of Maine include the world's largest database of chromosomal images, used to detect tumors, the monitoring of inflatable structures designed by NASA and studies on the sleep behavior and neurophysiological patterns of sleeping infants. A sample of noteworthy innovations at the university include inventing water purification systems, authenticating the Dead Sea scrolls, creating the field of genetic engineering, developing saccharine, creating the CPR method and inventing the supersonic ramjet engine. Coming in second place for total R&D expenditures behind Johns Hopkins University, UM received $814.2 million from the federal government for research and development in the 2013 fiscal year. The entire state received $1.826 billion during the same period, meaning the university received nearly 45% of statewide federal funding. In 2014 alone, the research division patented over 430 new inventions, with pioneering work completed in microbeam analysis, nanofabrication and robotics. Standout innovations include helping to develop iodized salt, establishing the first genetics department and developing pharmacokinetics. UM has innovated a number of breakthrough ideas, including the black box flight recorder, anti-AIDS drug Ziagen and 26 different varieties of apples. It was also where the first open heart surgery and first transplants of a pancreas and human bone marrow took place. Nationally, the University of Mississippi receives more funding than 88% of all other institutions, with federal R&D spending for the 2013 fiscal year equaling $64.6 million. Compared with the statewide federal research and development budget of $567.7 million, this public research university receives well over 10%. Current research centers range from intelligence and security studies to earthquake preparedness and botanical dietary supplements. The school is internationally recognized for its work in transplantation, being the first institution to transplant a human lung. It was also responsible for the first transplant of an animal heart to a human, using that of a chimpanzee. In the 2013 fiscal year, Missouri received $1.058 billion in federal dollars earmarked toward research and development. Of that sum, WUSL received $411.3 million, or nearly 39% of the total annual budget. Out of 23 Nobel Laureates who’ve called the university home, nine completed their groundbreaking research while at the school. WUSL is recognized for its advancements in social work and public health and is world renowned for breakthroughs in medicine. The Genome Center played a massive role in the Human Genome Project, contributing one-quarter of the completed sequence. MSU is responsible for much of the research conducted within the Yellowstone ecosystem, historically receiving five times more funding for Yellowstone-related work than any other institution. Pioneering work in alcohol and smoking related diseases also make UNMC stand out both nationally and internationally. Operating as one of two institutions in the University of Nevada system, UNR was provided with $56.9 million in federal research and development dollars for 2013, ranking it in the top 75th percentile of R&D expenditures in the nation. Nevada as a whole received $584.52 million in R&D earmarked federal dollars, meaning UNR received just less than one-tenth of the full budgeted amount. The school is nationally recognized for the work of the College of Engineering in areas of earthquake preparedness, structural testing and civil engineering, while innovations in microbiology, climate change and computer science are also well regarded. Proving its commitment to being a top research institution, the school has tripled its sponsored grants and contracts in the last decade, which now exceeds more than $150 million annually. In 2013, RSUNJ expended over $493.3 million in research and development, and $295 million of these were federal dollars earmarked for such activities. With a statewide federal R&D budget of $1.727 billion, RSUNJ’s share alone constitutes over 17%. The school is one of 62 research institutions that is a member of the prestigious Association of American Universities and has also been classified as having very high research activity by the Carnegie Foundation. The school’s university libraries rank among the nation’s best and is the 44th largest in the country. UNM's Southwestern research efforts are some of the most extensive in the nation, encompassing the archaeology, biology, climate and culture of the region. A recent highlight is a Ph.D. student's work on stream flow, with the Rio Grande at the inception of the study. Based in the largest city in the U.S., Columbia University is in the 97th percentile for total R&D expenditures, with nearly $636 million being poured into the institution by the federal government annually for research and development. In a state that receives $4.605 billion annually for federal R&D, CU commands a significant 14% in overall funds. The school has a longstanding history of innovative research, first hitting the international spotlight for its research into atoms and starting The Manhattan Project in the 1940s. Today, the institution has a wide spectrum of research interests, ranging from health sciences and pharmaceutics to American studies and climate change. During the 2013 fiscal year, North Carolina-based Duke University received nearly $1 billion in R&D funds, with $582 million coming from federal dollars. The school is ranked 8th nationally for R&D expenditures and commands 33% of the state’s $1.759 billion in federal research and development funds. Current research interests are vast, ranging from forestry and chemistry to plant nanostructures and public policy. The school has been credited with creating the first working invisibility cloak, along with mapping the last human chromosome for the Human Genome Project. In a state that received $89.5 million in federal dollars earmarked for research and development, the University of North Dakota’s obligations totaled $46.5 million, or more than half of the statewide budget for the 2013 fiscal year. The Carnegie Foundation gave the university a ranking indicating a high level of research, with special focus given to aerospace, energy, environmental sciences, health sciences and nutrition. The biggest area of expenditures is in environmental protection, with ongoing research devoted to hydrogen technology and energy consumption. CWRU is a private research institution in Cleveland, with federal R&D funds for the 2013 fiscal year exceeding $349 million. As a whole, Ohio received $2.426 billion, giving Case Western 14.4% of the overall budget. Special areas of interest include biomedicine, electrochemistry and electrochemical engineering, with other topics ranging from robotics and genetics to mental health and physics. The school has the distinction of being the home of the first person to win a Nobel Prize in science, of being home to the first doctor to perform a blood transfusion and being the research institution where drinking water chlorination was developed. The school's research campus is home to the National Weather Center, putting it at the forefront of meteorological studies; recent work conducted includes the launch of a lab dedicated to innovations in radar and an extensive research panel on lightning studies. The school is also home to the first program funded by the Clinical and Translational Sciences Award. UPenn is a large, public research institution with a federal R&D budget that confirms the level of importance placed on the findings coming out of this university. The school ranks 18th out of 643 institutions for total R&D expenditures, with 2013 funding exceeding $636.5 million. Pennsylvania as a whole received $3.295 billion during the same time, giving UPenn a 19.3% share. As one of the preeminent Ivy League research institutions in the nation, Brown consistently ranks in the 90th percentile for research and development expenditures. In the 2013 fiscal year, the school received $126.6 million from the federal government, a 26% share of Rhode Island’s total $486.4 budget during the same time period. Brown is consistently recognized internationally for its innovations and progressive modes of research, with centers and institutes spanning from school reform and biomedical engineering to women’s health and Latin American studies. Currently, the school is making waves due to groundbreaking research into higher-quality carbon nanotubes. As one of the oldest medical schools in America that’s been in continual operation, MUSC has a long and distinguished history of groundbreaking research. In the 2013 fiscal year, the university received $127.5 million in federal R&D funding, or 32% of the state’s entire federal research and development budget of $397.5 million. SDSU, the largest university in South Dakota, receives a significant part of the state’s federal funding for research and development activities. The 2013 fiscal year saw the school being given $33.2 million and putting it in the top 28% of all institutional spending for R&D. The school is active in many different areas of research but is consistently recognized for advancements in the fields of engineering, agricultural science and biological science. In addition to many centers and institutes located around the campus, the school also has numerous agricultural research stations scattered throughout South Dakota. Notable accomplishments over the year include creating the first research center for ethanol fuel, inventing the internal combustion engine and developing cookies and cream ice cream. One of the odder forms of "research" conducted at Vanderbilt is work on the game bridge, particularly contract bridge, which is believed to be invented in the 20s by no less than Harold S. Vanderbilt, a great-grandson of the founding family. The university maintains its own bridge center. The school is also distinguished for having the only school of tropical medicine serving both patient and research needs. Notable past researchers at the institution have been responsible for a variety of groundbreaking work, including implanting the first artificial heart, pioneering minimally invasive treatment for vascular disease and developing the first cardiac autotransplantation for cardiac sarcoma. During the 2013 fiscal year, the University of Utah expended nearly half a billion dollars in research and development, and $301 million of this funding came from federal funds. The Carnegie Foundation identified the school as having very high research activity, with interests spanning from cerebrovascular diseases and cell signaling to extreme data management and human toxicology. UU has been in the international spotlight multiple times throughout the years for pioneering research, including unique genetics research with the LDS Church, which allowed researchers to follow genetic diseases through multiple generations. The school is also responsible for implanting the first permanent artificial heart in 1982. In a state that received $102.95 million in federal dollars for research and development, the University of Vermont’s $85.1 million budget takes up a massive 82.6% of overall funding. All research is completed under the umbrella of eight different colleges, with focuses ranging from Holocaust studies and translational science to substance abuse and neurodevelopmental disability. 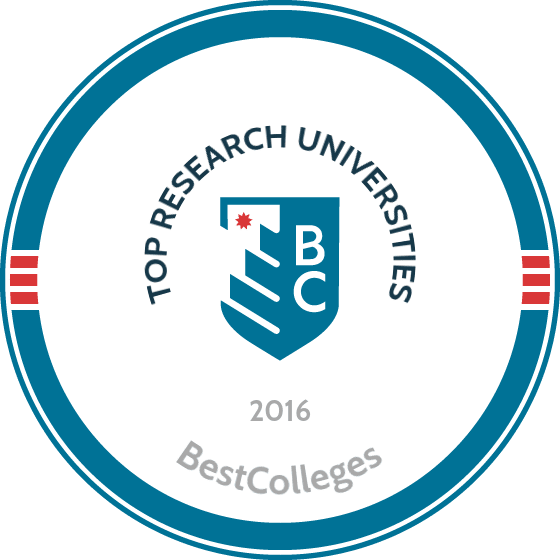 Although the school has less capacity than massive Big Ten schools, it is consistently recognized as one of the top 25 small research universities in America. Over the past four years, UW has expended more funds toward research and development than 98% of all institutions in the nation, with federal funds totaling $928.2 million in 2013. Overall, federal R&D funds for the state equaled $3.434 billion for the same year, giving UW 27% of the total budget. It receives more federal funding than any other public university and ranks second amongst both public and private institutions for federal R&D spending. In 2015, Reuters named UW the world's most innovative public university; some of the school's most recent efforts capture that innovation: such as launching the world's largest underwater observatory, creating a new computing language to help build DNA models and studying ferret genomes to better treat respiratory diseases in humans. UW also has the distinction of owning ResearchChannel, the only television channel devoted to sharing academic research findings. Research interest at the school cover an array of fields, ranging from Asian law and infant mental health to lung biology and penguins. Researchers at the school have received global recognition in years past, with innovations including a cloned American chestnut, the discovery of millisecond pulsars and pioneering biometric identification used by the FBI. Major breakthroughs coming out of UWM include the first isolated human embryonic stem cells, extensive work in oceanography and coastal protection and, most recently, work developing and thereby better understanding leukemia cells. Given its rural location, some of U. Wyoming's greatest accomplishments rest in agriculture, water research and animal husbandry, with a recent announcement spotlighting work on nontraditional crops, innovations in the care of dairy cattle and breakthroughs in controlling the animal and plant diseases that hurt farmers the most, such as poultry diseases and a particular form of potato blight. Department of Commerce: In 2011, the DOC obligated $1.4 billion in R&D funds, of which 29% was allocated toward businesses, universities and colleges. Specific uses include research in oceanic and atmospheric administration. Department of Defense: The DOD's 2011 obligations totaled $6.6 billion and promoted research in engineering, mathematics, computer science, physical science and life science. Department of Energy: The DOE obligated $6.8 billion in 2011 for R&D, with funding providing for research related to physical science, engineering, mathematics and computer science. Department of Education: The ED obligated more than $100 million during 2011. Environmental Protection Agency: The EPA obligated more than $100 million during 2011 to areas of environmental sustainability, climate change and forestry. Department of Health & Human Services: HHS accounted for 54% of all federal obligations during the 2011 fiscal year, with $31.8 billion going toward both basic and applied research. National Aeronautics and Space Administration: With a budget of $8.4 billion, NASA obligated funds to engineering, the physical sciences and environmental sciences. National Science Foundation: The NSF used its $5.4 billion to fund research in areas of basic science, engineering, environmental science, mathematics, computer science, the physical sciences and engineering. Department of Agriculture: In the 2011 fiscal year, the USDA disbursed $2.4 billion in obligations, directed towards the life and agricultural sciences. To see a full list of federal obligations, review the National Science Foundation's report on federal R&D performance and funding. The methodology behind our rankings is grounded in statistical data and a few consistently applied guiding principles, including academic quality, affordability, and online competency. Our 2016 rankings reflect the most recent data available from the Integrated Postsecondary Education Data System (IPEDS) and College Navigator, both of which are hosted by the National Center for Education Statistics. Our goal is to objectively assess relative quality based on academic outcomes, affordability, and the breadth and depth of online learning opportunities.